Each day is filled with teachable moments. Most are overlooked in our busyness. However, when we intentionally look for and key in on these opportunities, much can be gleaned. A mom was complaining that her children NEVER get the public recognition they deserve. As moms, we want our kids to succeed, and we want other people to recognize how special and outstanding they are. When public recognition doesn’t happen, we may call “foul” and claim “no fair”! Although this may be a fairly normal response, it is not a biblical response. Moms, our kids hear and see our response, giving them permission to act the same. So what does the Bible say about such things? The italics are mine for our attention. Do you notice the pattern here? We and our children should not be doing things for our own applause, but rather so others praise and glorify God. If we live with this mindset, we will not be tripped up and insulted when others do not notice our accomplishment or good deed. Plus, if our children grasp this concept at a young age much drama and heartache can be avoided. Relate it to the kids. Help them learn to do what is right for the right reason – so God will be praised. Pay attention to the teachable moments God gives you, and use those moments to help yourself and your kids live life in ways that cause others to give God praise. I have been doing a good bit of reading this week. Sometimes I find myself merely reading words and not taking the time to absorb the message and meaning of the passage. So this week I read with a slow take, intentionally absorbing and comprehending. Let me share some lines that have especially stood out to me. Storytelling – start at the beginning and move sequentially. Mathematical – to learn a new concept, build from the foundation up; move from the known to unknown. Priority – major on the majors, learn the most important points first. Clarity – don’t mix your subject matter; stick to one theme at a time. 3. 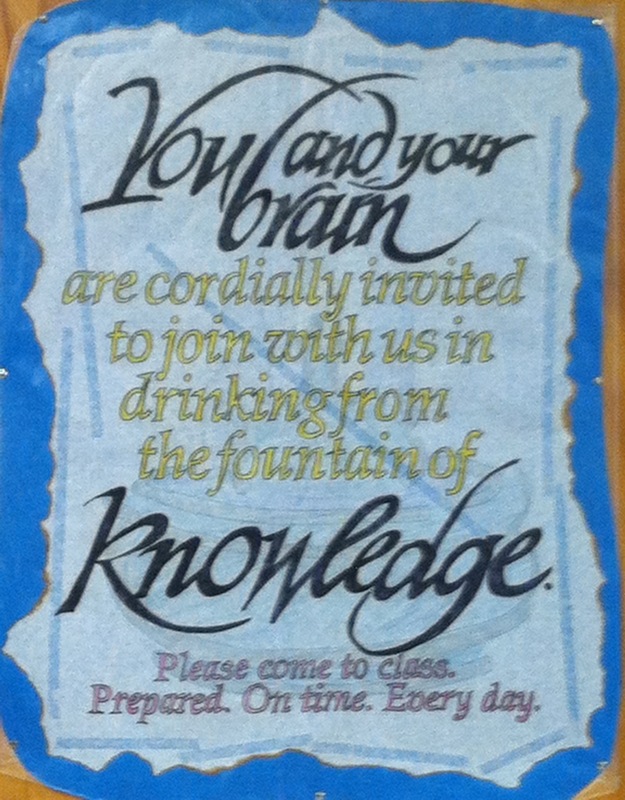 This poster was in a classroom I subbed in this week. 4. The following quote had my good friend at Prairie Rain Designs written all over it. She is so very creative. An artist is someone who has the ability to see beyond what IS to what CAN be. 6. A fallen leaf is nothing more than a summer’s wave goodbye. This is just a sampling of words I have read and pondered the past few days. What are you reading? Is it time for you to do a slow take, and let the words sink in for deeper meaning and understanding?